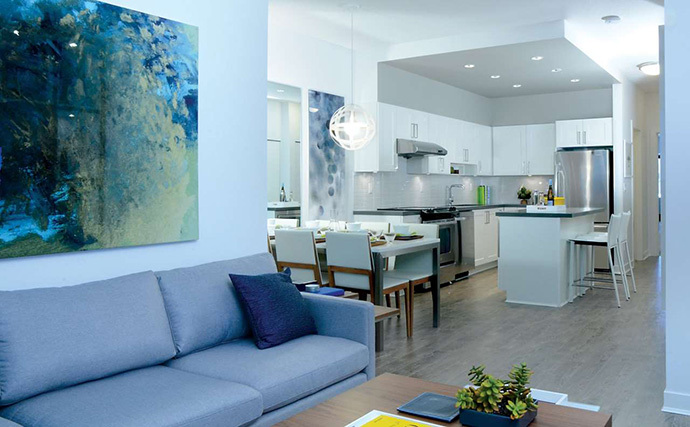 The Vancouver Condo Buzz » From Low $200’s > New Coquitlam CHARLAND Condos Near Evergreen SkyTrain Line > Only 88 Boutique Coquitlam Apartments Available Now! « From $239,900! THE LOOKOUT at Victoria Hill New West Condos by Onni > The Pinnacle of this Master Planned New Westminster Waterfront Community! 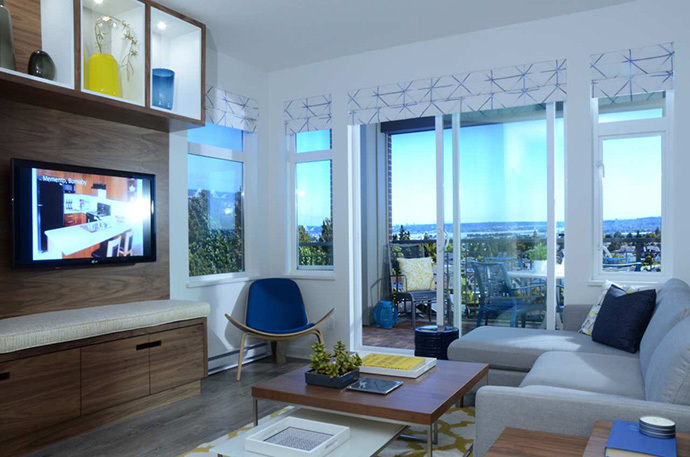 A new and exciting project is now selling at Coquitlam’s Charland condo residences! Featuring a spectacular three tiered infinity pool entry water feature and a peaceful bamboo garden, these new Coquitlam condos for sale is a step above the rest! The building is designed by award winning Robert Ciccozzi Inc and inspired by the late architect, Frank Lloyd Wright and features stunning architecture with cantilevered roof overhangs. The property will also include a large rooftop terrace with view out to Mount Baker, the Gulf Islands and the Fraser River. The over height entrance will have historic brick accents, dramatic lighting as well as fine finishes. There’s extensive masonry, brick and wood details, as well as concrete fibre siding. All of the building finishes are carefully constructed with the latest rain screen protection system. The sliding glass doors and swing doors (wherever applicable) as well as vinyl windows are double glazed and energy efficient and all homes will have hard wired smoke detectors and fire sprinklers throughout. The new Coquitlam Charland condos will also have security systems with motion detectors (entry and patio doors for ground level homes). All homes will come pre-wired with security system and motion detector on contacts for the entry and patio door. The boutique Charland Coquitlam condos will also have an underground parkade and well lit pedestrian walkways and common areas. The main lobby entrance will also have an enter phone system with video surveillance. All homebuyers at Charland Coquitlam condos will get the Traveler’s Guarantee Company of Canada Warranty Insurance coverage of 2-5-10 years. This exceptional property is just 11 minutes away from Burrard Inlet. The Tri-Cities are within easy reach as are boutique retailers, big box shops, restaurants, cafes, services and recreational facilities. If you are looking for more information about the Coquitlam Charland condos, please visit their marketing web site at www.ledmac.com/charland today to register your interest. You can also visit the Charland presentation centre which is now open. The project is also very close to the Evergreen SkyTrain Line. The Pre-Sale Coquitlam Charland Apartments Now Selling! The homes at Charland in Coquitlam real estate market are simply stunning. The suite entry door is contemporary, flat panel and clean and features modern chrome lever hardware by Taymor (and a deadbolt). The living spaces have overheight 9 foot ceilings (with over height windows) and there are Decora style light switches throughout the homes. The pre-sale Coquitlam Charland apartments will also feature 2 custom designed schemes called Evergreen and Dogwood. The entryway, kitchen, dining and living room have durable, contemporary style laminate floors by Evoke while the bedrooms have Beaulieu loop and pile carpets for that cozy feel. There are conveniently located cable and/or telephone outlets in the bedrooms, kitchens and living room depending on your floor plan and there is also pre-wiring for high speed internet access and digital cable. Some of the floor plans at Charland Coquitlam pre-sale apartments have large walk in closets with closet shelving. Also there are spacious outdoor living spaces and two individually coded security key fobs for the parkade and most common areas per suite. The homes are heated with baseboard heating and there are bike size storage lockers provided for each home as well as a dedicated bike repair station. The beautiful bathrooms at the pre-sale Coquitlam Charland apartments will have porcelain tiled floors. The private master ensuite bathrooms will feature luxury ‘Bowen’ soaker tub with full height tiled ceramic surrounds in addition to a Ledward Kohler shower with seat, grab bar, and tiled surround in some homes. Also, the master ensuites at the Charland Coquitlam pre-sale apartments will feature square edged quartz stone counters in addition to Verticyl Kohler under mount sinks. There’s also a high-end Kohler single lever pressure balanced shower control for safety and comfort in addition to a large mirrored vanity and stylish light fixture included as standard features. The water closets are by Kohler and are low flow for water conservation. In addition, the Coquitlam Charland floor plans all have in-suite laundry closets that have porcelain tiled flooring and front loading two piece stacked washer and dryer by Whirlpool. The kitchen spaces at the new Coquitlam Charland apartments are also spectacularly designed and finished. There are 2 design schemes again. The Dogwood palette will feature white shaker style cabinetry with stainless steel modern pulls in addition to quartz counters paired with linear style ceramic tile work. The Evergreen palette features flat panel cabinetry in warm grey wood grain finishing fitted with the same stainless steel modern pulls in addition to quartz composite counters with contemporary porcelain mini-mosaic tiled backsplash. All homes at Charland Coquitlam pre-sale apartments will come with a sleek 18.6 cubic foot fridge with bottom freezer drawer by Whirlpool, an electric slide in range with self cleaning oven by Whirlpool and a turbo range hood fan by Sakura. Also, all homes have a Panasonic microwave (top of the line) and an energy efficient dishwasher by Whirlpool. 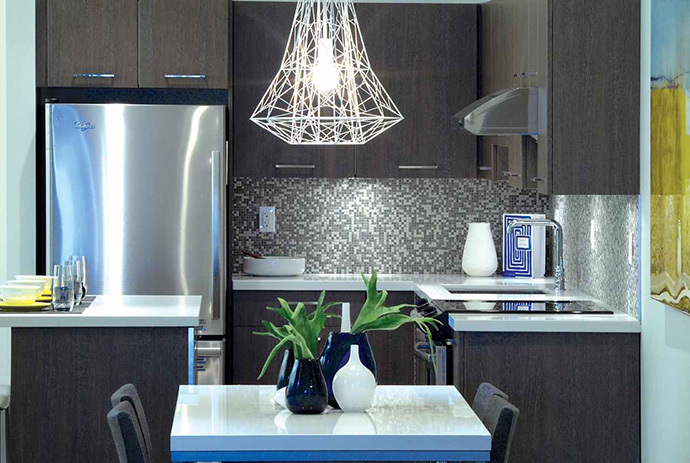 The Charland Coquitlam apartments also have halogen pot lights and under cabinetry lighting. There are deep square edged stainless steel single bowl sink with Kohler faucet in addition to custom designed cabinetry with soft close mechanisms for both drawers and cabinets. Most kitchens will also have a convenient breakfast bar or island. Coquitlam and the Tri-Cities are well known for their liveable, walkable and environmentally friendly communities. Here at the new Charland Coquitlam condos, residents can enjoy everything within a short walk or drive away. In terms of community and recreational options, you are very close to the Poirier Sport & Leisure Complex, Coquitlam Public Library, Place Maillardville Community Centre, The Zone Bowling, SilverCity Coquitlam, Boulevard Casinos & Red Robinson Show Theatre, Steve Nash Fitness Gym, Cameron Recreation Complex, Burnaby Public Library, Northgate Village, She’s Fit Gym, Burquitlam Plaza, Kensington Pitch & Putt, Burnaby 8 Rinks and Fortus Sport & Health. In terms of educational facilities near the Coquitlam Charland condos, you’re very close to Sunny Gate Montessori, Lord Baden-Powell Elementary, Anderson Elementary, Maillardville Middle School, Rochester Elementary, Como Lake Middle School, Centennial High School, Coquitlam College, Mountain View Elementary, Banting Middle School, Port Mood high School, Simon Fraser University – main Burnaby campus and Porter Street Elementary. There are also numerous golf courses, green spaces, parks, restaurants, pubs, cafes, eateries and shopping nearby.